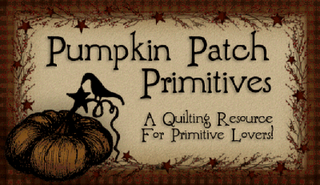 Amy over at Amy's Creative Side is sponsoring a Blogger Quilt Festival this week and I decided to participate by showcasing one of my favorite quilts (my current favorite!). I have many quilts that I could have chosen, especially since I've been on a "Finish it!" 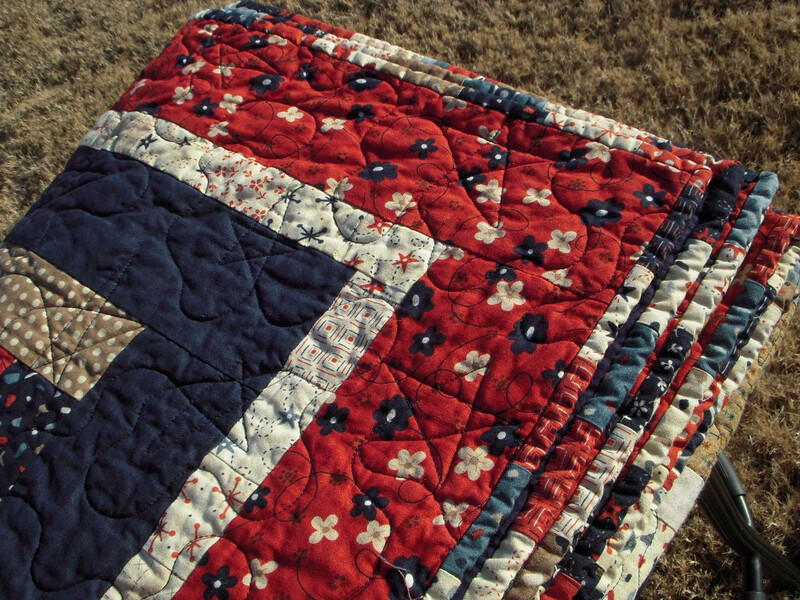 binge this last year but I admit that the quilt that I most love is my Red White and Blue piece. I made this one as a Christmas present for my sister last year. I completed the top by August but it was not until I discovered Margaret from Mainely Quilts of Love that I actually had any hopes of finishing it on time. 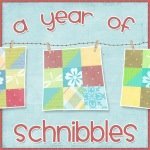 I used a Jelly roll from Sandy Gervais' Zippity Doo Dah line and a couple of Charm packs. The backing was made from flannel and pieced with a few left over scraps. I also used more of the left over scraps for the binding. The stars were appliqued leaving the edges raw so when the quilt was washed it turned all scruffy. I love that it feels so cuddly and warm. I see it often since my sister and I share a house and she keeps it at the foot of the bed. I was really happy how this one turned out and sometimes I wish I had made one for myself but with so many gorgeous quilts waiting to be made I have trouble repeating a design. I'm thinking that the next 'favorite' quilt is just a binding away! Don't miss all the other great quilts being displayed this week during the Blogger's Quilt Festival. Just click on the image below to take you to the list of blogger's participating! 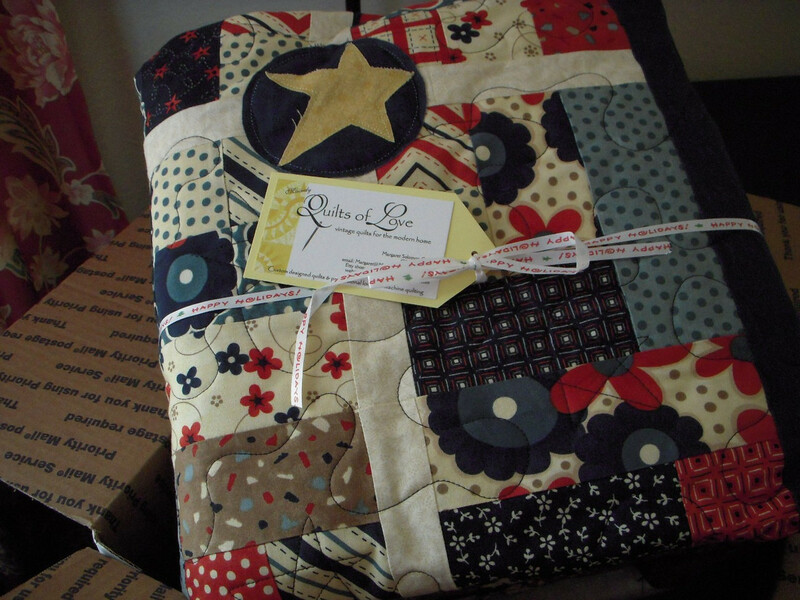 28 comments on "Blogger's Quilt Festival"
This looks fantastic, I love red, white and blue! I love your quilt! The stars and the great colour scheme, this is one of my favs! fun quilt! love the back! I love it! Great fabrics, cute quilt! Lovely, lovely, lovely! Did I mention that is quilt is simply lovely? It looks great! Love the fabric and colors. This is lovely! What a great design! This quilt is so pretty! I love your quote about your next favorite is just a binding away! So so so true!!! Nice quilt. It does look cozy and comfy. FUN!!! love the ragged stars! very snuggly! Wonderful quilt! Can't go wrong with red, white and blue. I also have trouble repeating a pattern. I love this quilt. I have a red,white and blue jelly roll I have been looking for a pattern for. The stars in the circles are what sold me. Would you mind if I used your pic in my 'wanna be' quilt file? It is only for my use so I remember what I want to make. It is a wonderful gift for your sister- it looks like a very fun pattern to make. Thanks for sharing your beautiful quilt and story. I can sure relate to your "current favorite" comment. My favorite changes like the weather, but most of mine don't fall out of favor, which is a good thing. Lovely, lovely quilt! How wonderful that you get to see that it's loved and used. This is a lovely quilt. Blue, red, white is just a very cool combination. Really nice work. 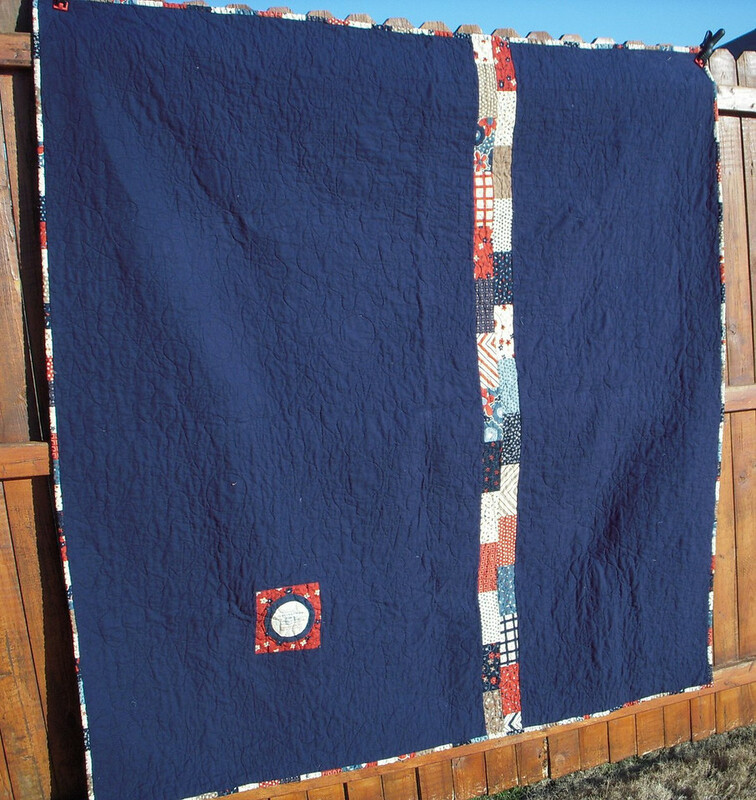 I lOVE red, white, and blue quilts...especially with the stars...has to be one of my favorite quilts in the festival! Very, very, very nice quilt!!! Good work!!! Happy Festival! 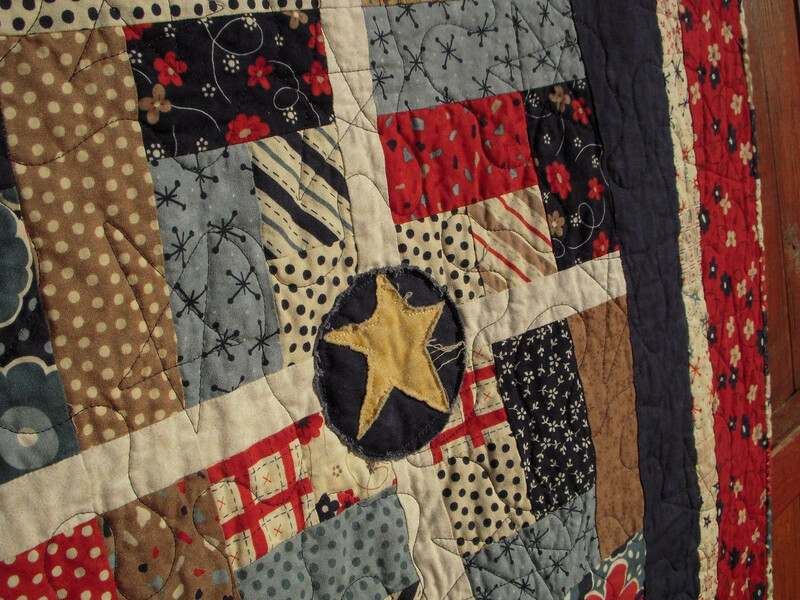 What a fun quilt-the pattern is so creative (sashed half logcabin) and stars are always my fav. Lovely quilt. Great selection of prints and colors for a wonderful design. You did a great job. 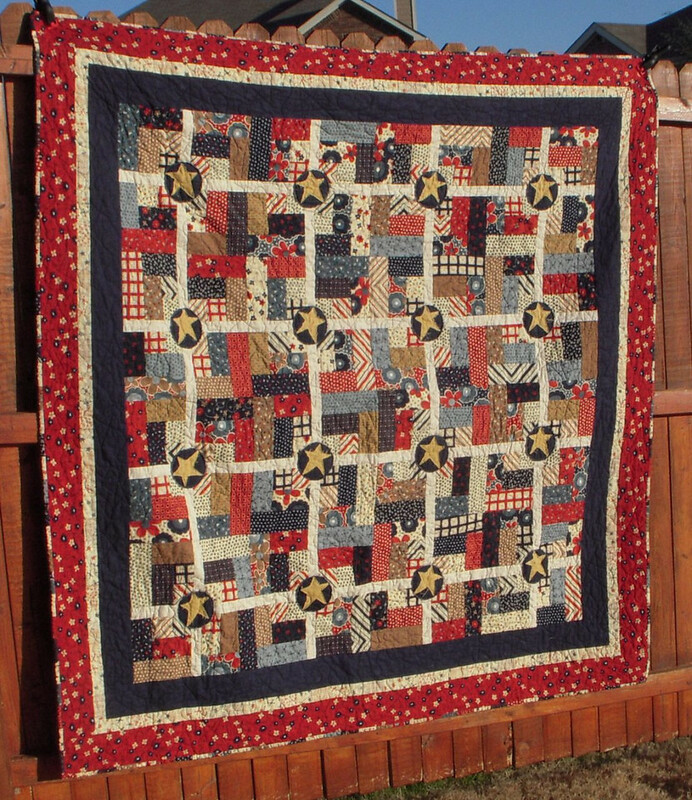 So perfect for Memorial Day :) Love the colors in this quilt. Thanks for sharing!! Great back with the small square off to the side. The stars are great. Love me some red white and blue! What a fabulous quilt! So fun! I love the star details :) Thanks so much for participating!